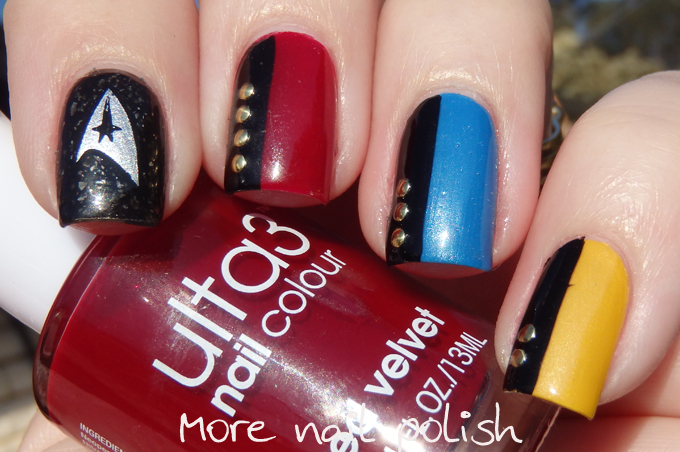 I've been planning to do Star Trek nails for ages, and never had the appropriate reason to do them. 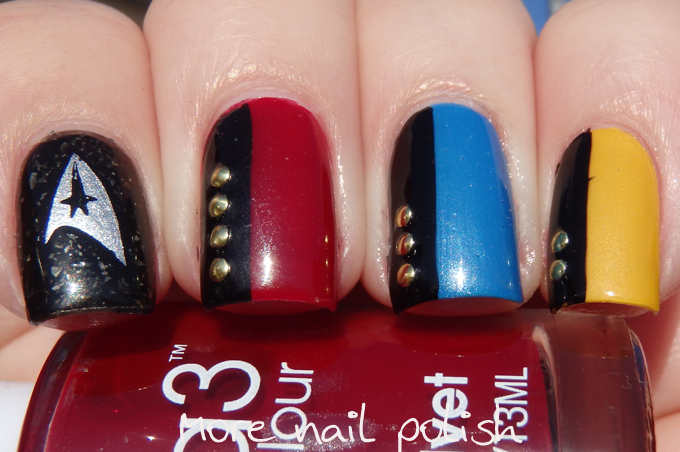 But this weeks prompt for the 52 Week Challenge is Geeks, and after getting myself all confused between what nail art would be considered Geeky compared to Nerdy, I finally settled on creating Star Trek nails. 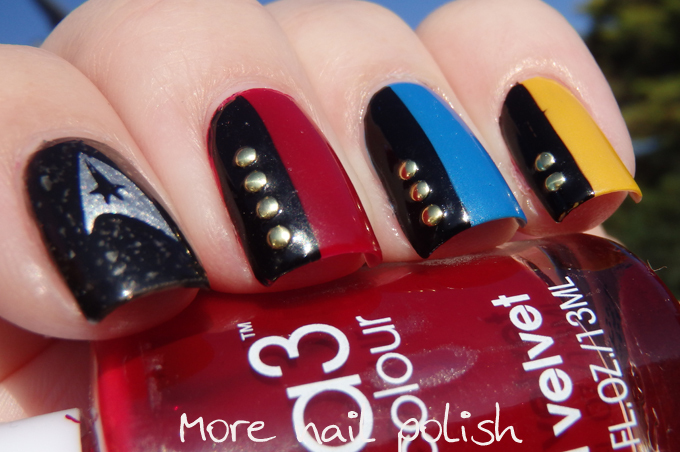 Specifically I'd say my nails are inspired by the Star Trek Next Generation uniforms. 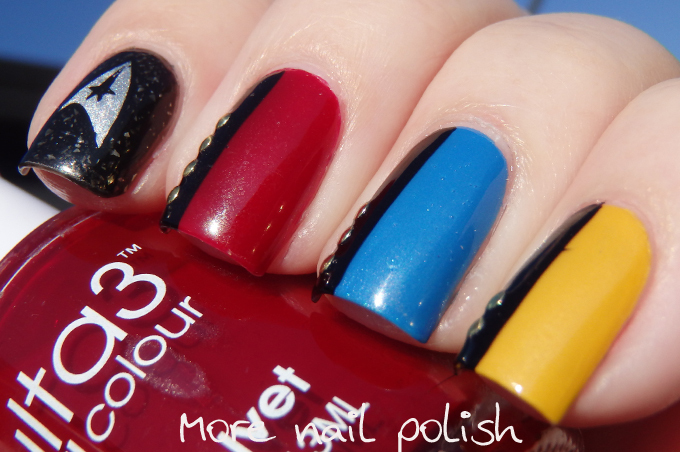 I painted my nails with each of the uniform colours. Red, which indicates a command role, blue for the science and medical roles and yellow for the engineering, security and operations roles. Not only did I do the uniform colours, but I even gave each uniform a different rank, with a Captain, a Commander and a Lieutenant (see, look at me getting my geek on)! On my index finger I made a stamping decal of the Star Trek Communicator thingo they wear on their shirts. they are awesome cathy! i love them!!!! !you needed my tricorder as a mani prop LOL!!! I love this set! I'm geeking out right now. You nailed it! Your colors are totally correct and I love the rank buttons! The graphic, simple approach you chose - it elevated the mani above being cartoonish. Great choices! As a trekkie, I love this design! Would you tell me which plate you used for the communicator stamping? 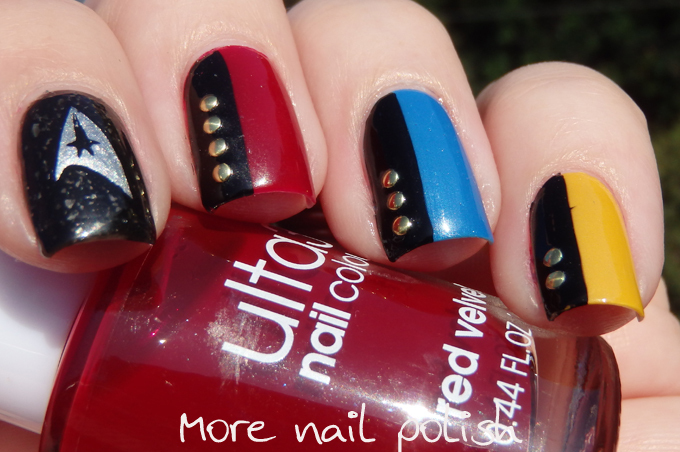 The stamping plate with the star trek communicator is FUN11 by FAB UR NAILS. Yellow/gold is command and red shirt is engineering and often the expendables. Never beam down in a red shirt.